When Dr. Leo Liebenstein's wife disappears, she leaves behind a single confounding clue: a woman who looks, talks, and behaves exactly like her. A simulatcrum. But Leo is not fooled, and he knows better than to trust his senses in matters of the heart. Certain that the real Rema is alive and in hiding, he embarks on a quixotic journey to reclaim her. With the help of his psychiatric patient Harvey--who believes himself to be a secret agent able to control the weather--his investigation leads him from the streets of New York City to the southernmost reaches of Patagonia, in search of the woman he loves. 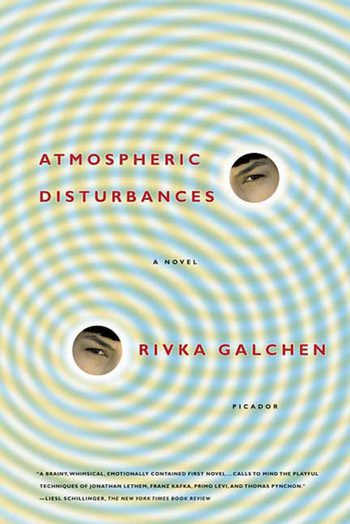 Atmospheric Disturbances is a "witty, tender, and conceptually dazzling" (Booklist) novel about the mysterious nature of human relationships. Rivka Galchen's impressive debut novel begins: "Last December a woman entered my apartment who looked exactly like my wife." We dare you to not read further! Here's the international book trailer for "Atmospheric Disturbances." RIVKA GALCHEN recieved her MD from the Mount Sinai Shool of Medicine, having spent a year in South America working on public health issues. Galchen recently completed her MFA at Columbia University, where she was a Robert Bingham Fellow. Her essay on the Many Worlds Interpretation of quantum mechanics was published in The Believer, and she is the recipient of a 2006 Rona Jaffe Foundation Writers' Award. Galchen lives in New York City. Atmospheric Disturbances is her first novel.